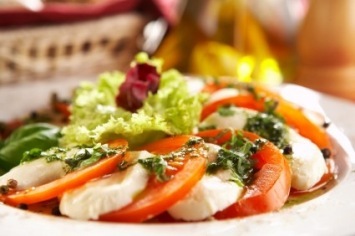 Caprese salad is a classic Italian salad recipe. It is so simple to make. Just layer a few simple fresh ingredients, drizzle a bit of olive oil and you’re done. This salad can be arrange on one larger plate or on individual serving plates. Arrange tomato slices in a circle around the plate, then overlapping towards the center. As you are laying out the tomatoes, place a thin slice of mozzarella cheese on top of each slice of tomato. Place a whole basil leaf on top of the mozzarella cheese. Add salt and freshly ground pepper to taste. Lightly drizzle extra virgin olive oil over the salad. I love a bit of good quality balsamic vinegar drizzled over the salad as well. 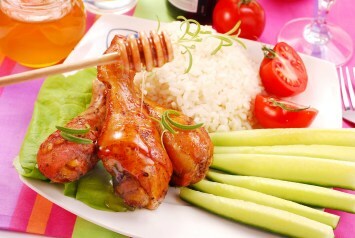 It adds a beautiful, rich, savory flavor to the mixture. The quality of the mozzarella cheese and the olive oil really count in this recipe. I would definitely use extra virgin olive oil. If you can get fresh mozzarella cheese or bocconcini cheese they are perfect in this recipe. If not, use the best and freshest you can find. When a recipe is this simple, fresh, good quality ingredients really stand out. This recipe is fantastic when tomatoes are fresh, in season and locally grown. They will have the most amazing flavor, so different than those winter, pale pink tomatoes. Tomatoes are SO healthy for us, especially if you buy local tomatoes in season, when they have had the opportunity to ripen on the vine. Caprese salad is just one of our tasty Italian recipes. Search them here.